X-10-M - RitchieSport (Bracket Mount) Features: Easy-to-Install on Windshield or DashTwo-Sided, Self-Adhesive Mounting Pads Included.2"Direct-Reading, High Visibility Dials.Reversible Bracket allows a mounting range of over 300Deg from overhead, through angled and vertical mounts to horizontal surfaces.These mounting position options and your choice of mounting hardware permit mounting on everything from windshield or supporting frame structures, to slanted dashboards and consoles, to almost any flat, angled or vertical surface.Internal Green Night Lighting.High Temp Composite Construction for Extended Operating Range.Hardened Steel Pivot and Sapphire Jewel Movement.Built-in Compensators.Color: Gray.Exclusive 5-Year Ritchie Warranty Comes standard with 12 volt lighting.For all X-10s built before the year 2000 please see the service manual page 1-2 or contact Ritchie for replacement lighting. Easy-to-Install on Windshield or DashTwo-Sided, Self-Adhesive Mounting Pads Included. 2"Direct-Reading, High Visibility Dials. Reversible Bracket allows a mounting range of over 300Deg from overhead, through angled and vertical mounts to horizontal surfaces. These mounting position options and your choice of mounting hardware permit mounting on everything from windshield or supporting frame structures, to slanted dashboards and consoles, to almost any flat, angled or vertical surface. Internal Green Night Lighting. High Temp Composite Construction for Extended Operating Range. Hardened Steel Pivot and Sapphire Jewel Movement. Built-in Compensators. Color: Gray. 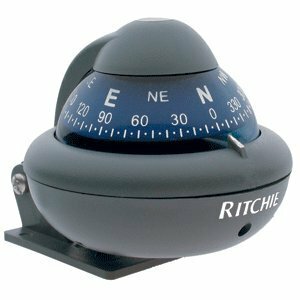 Exclusive 5-Year Ritchie Warranty Comes standard with 12 volt lighting. DETUCK(TM Navigation Compass Necklace Stylish Compass Gift for Your Family and Friends,Hikers,Campers etc.